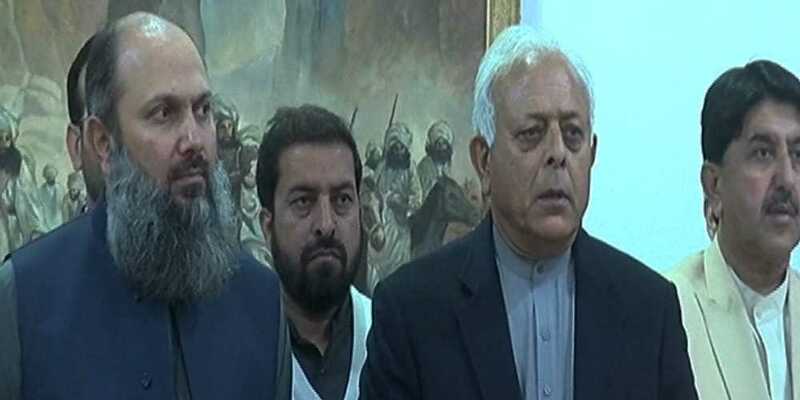 Minister for Petroleum and National Resources Ghulam Sarwar Khan says Board of Directors of all the Oil & Gas companies will be reconstituted to provide appropriate representation to all the provinces. He was addressing a press conference alongwith Balochistan Chief Minister Jam Kamal in Quetta on Friday. He said these boards will have equal representation from the Public and private sectors to provide an opportunity to high professionals to serve these companies in the oil and gas exploring and delivery sectors. The Minister said the government attaches top priority to the progress and prosperity of the people of Balochistan and will provide them all possible representation in the mainstream institutions. Ghulam Sarwar Khan said he is visiting Balochistan on the directions of Prime Minister Imran Khan and has held constructive talks with the Provincial leadership to resolve issues facing the province in a coordinated manner. He said, he has already visited Punjab, Sindh and Khyber Pakhtunkhwa for this very purpose. The Minister said the Federal government will work in close liaison with the Balochistan government to resolve all the problems pointed out by the provincial chief minister, addressing their sense of deprivation. The Petroleum Minister said working groups and committees have already been set up to finalize and submit their recommendations within a specific time frame to chalk-out a comprehensive policy on exploring the natural resources throughout the country. He said this process of dialogue and interaction would help adopt a cohesive and inclusive national policy to deal with the prevailing challenges effectively. Minister for Petroleum Ghulam Sarwar Khan said the ground breaking, for the establishment of a state of the art oil refinery in Gwadar, will soon be performed. He said the Saudi Crown prince is expected to visit Pakistan next month during which an MOU will be signed for the construction of the oil refinery. He said the Saudi energy minister will visit Gwadar tomorrow to inspect the land allocated for the proposed refinery. The Minister said China has no concerns over the Saudi investment in Gwadar and the Balochistan government has also been taken on board on the matter. The Petroleum Minister said it is our priority to ensure uninterrupted supply of gas to the domestic, commercial and export oriented industry. He said the government has given subsidy on gas to the tune of one hundred and twenty five billion rupees and still the gas tariff is lower in Pakistan as compared to the regional countries. To a question, the Petroleum Minister said fourteen billion rupees are being spent for provision of LPG mix to the towns and cities in Balochistan. He said land has already been acquired for the establishment of about twenty six plants for this purpose. Earlier, the Chief Minister Balochistan Jam Kamal enumerated the key issues facing the province in different sectors and urged the federal government to provide the requisite support to the provincial government in resolving these problems.